Bill continues to have increasing banding features. Convection near the center of circulation is marginal, but it looks like it is about to start wrapping into an eyewall feature. Again, excellent news is that the forecast models are starting to line up recurving Bill northeast of the Leewards by midweek. It is too early to tell if any of the bands from Bill will affect the islands. We'll keep you updated with our latest model interpretations as they come in. Next complete update will be this evening. Deep convection is now around the circulation center and will likely form an eyewall tonight. As this happens, Bill should reach minimal hurricane strength. Model trends have not changed, keeping Bill northeast of the Leewards and east of the U.S. coastline. We're still watching out for Bermuda down the road a bit. Bill continues its slow strengthening. Forecast models continue this trend, eventually making Bill a major hurricane in a few days ( cat 3 or higher ). Model trends have not changed, keeping Bill northeast of the Leewards and east of the U.S. coastline. We're still watching out for Bermuda down the road a bit. It's took early to know is any squall bands will affect the Leewards. Hurricane Bill continues to strengthen, with the southern eyewall stronger than the northern side. 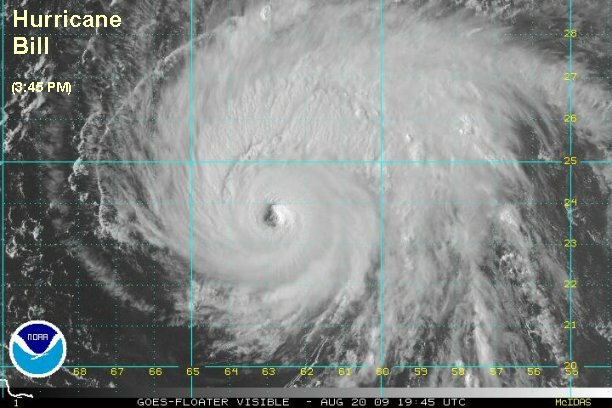 The eye is not visible yet, although a warm core is now apparent on the I.R. imagery. Because of this we are going a little weaker than NHC's wind estimate. 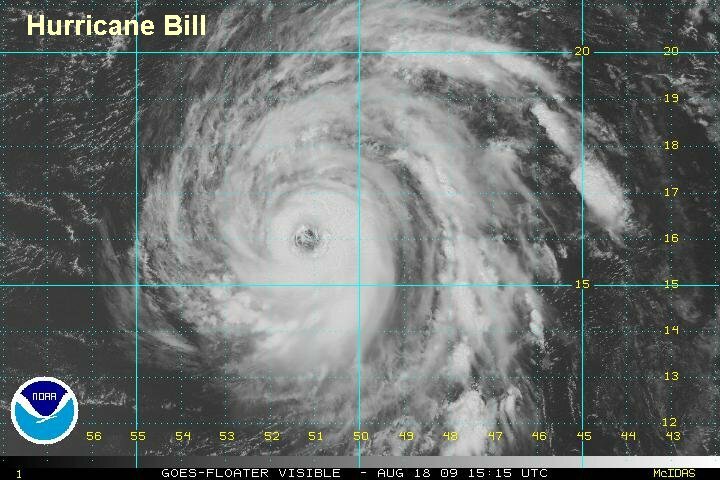 Hurricane Bill is not displaying a good presentation of its eye yet, but is growing in size. We believe that the methodical strengthening has continued. 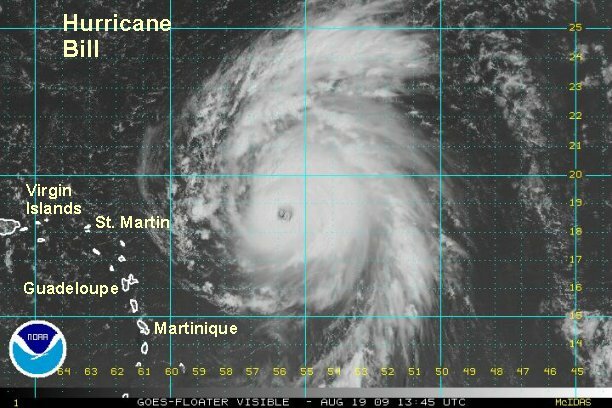 At 4:00 pm edt / ast Bill was centered near 14.8° N / 46.8° W or about 945 miles east of the Leeward Islands. Movement is west northwest at about 16 mph. We estimate top sustained winds of 90 mph and slowly increasing. 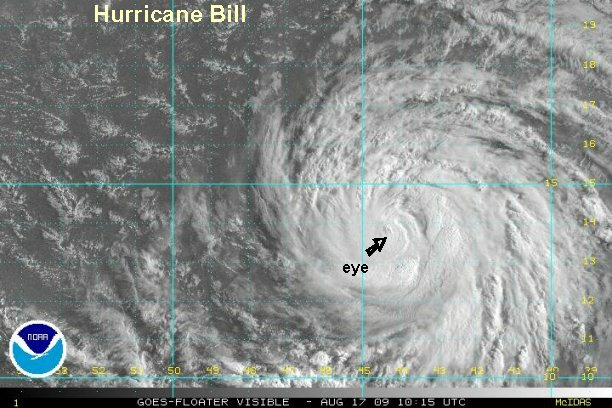 Bill's eye is lopsided, with very deep convection of the south side and considerably weaker structure on the north side. There is still the potential for a rapid deepening phase once the eye is more uniform. 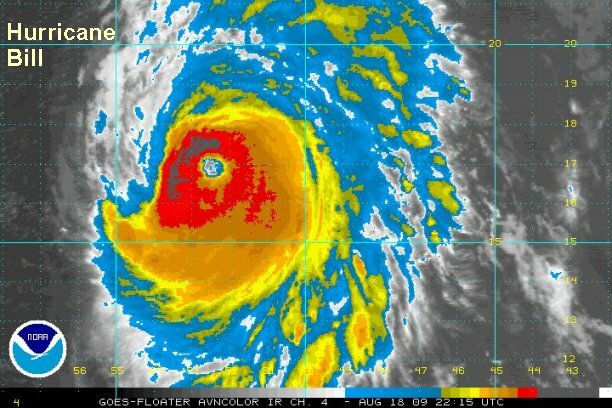 At 9:00 pm edt / ast Bill was centered near 14.8° N / 47.8° W or about 890 miles east of the Leeward Islands. Movement is west northwest at about 16 mph. We estimate top sustained winds of 95 mph and slowly increasing. Model trends have not changed, keeping Bill northeast of the Leewards and east of the U.S. coastline. We're still watching out for Bermuda. Timing may put Bill in the vicinity of Bermuda by Friday night. Bill is growing, but again it's too early to tell if any squall bands will affect the Leewards as it passes northeast Wednesday. Bill developed a well defined eye overnight and changed little in strength over the last several hours. We are also becoming more concerned that Bill will pass close to Bermuda by late Friday. After this, Bill recurves and nips Cape Race, Newfoundland. Bill is expected to stay east of the U.S. coastline. 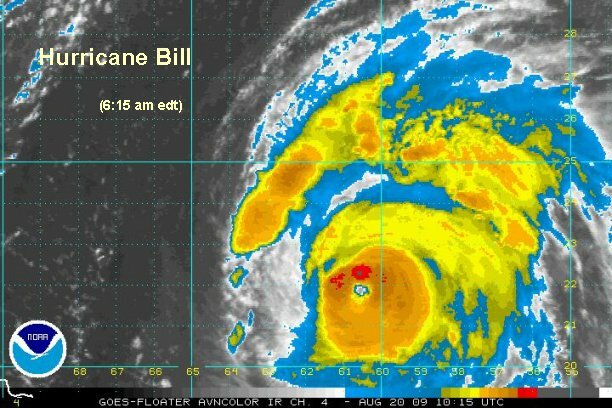 At 6:30 am edt / ast Bill was centered near 15.7° N / 50.2° W or about 735 miles east of the Leeward Islands / 1480 southeast of Bermuda. Movement is west northwest at about 19 mph. We estimate top sustained winds of 100 mph and slowly increasing. Model trends have not changed, keeping Bill northeast of the Leewards and east of the U.S. coastline. We're still watching out for Bermuda. Timing may put Bill in the vicinity of Bermuda by Friday night, with the effects increasing during the day Friday. Bill is compact without sprawling bands, so we're becoming optimistic that the squall bands may be northeast of the Leewards. 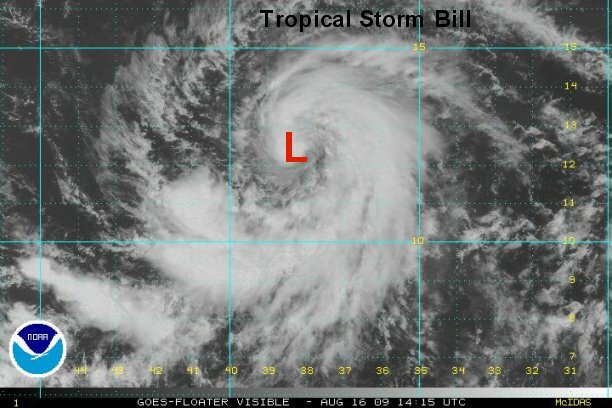 Bill is now looking like a classic hurricane. As we mentioned last night, there was a possibilty of it going through a rapid deepening phase. 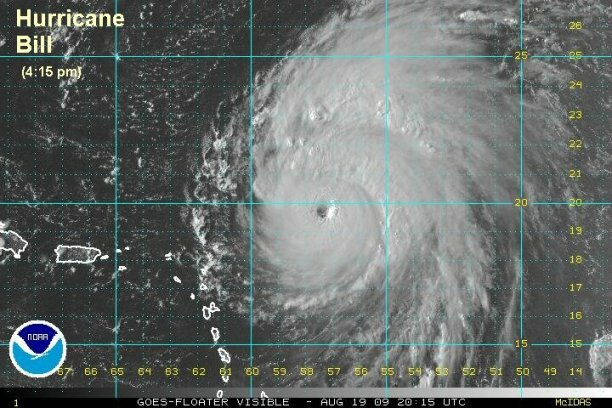 It appears that the hurricane is about to start strengthening more quickly. 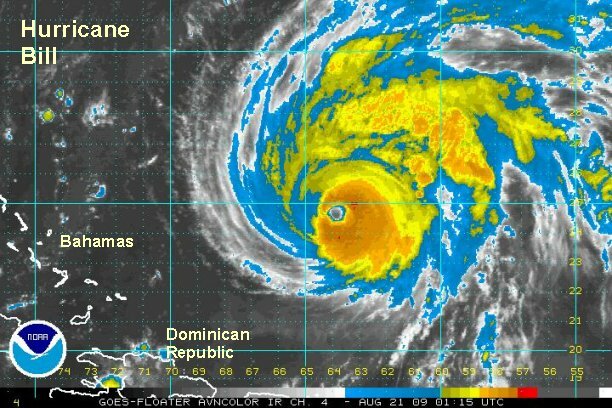 At 12:30 pm edt / ast Bill was centered near 16.0° N / 51.4° W or about 640 miles east of the Leeward Islands / 1400 miles southeast of Bermuda. Movement is west northwest at about 16 mph. We estimate top sustained winds of 110 mph and slowly increasing. We are also concerned that Bill will pass close to Bermuda by late Friday. The official NHC forecast has Bill west of Bermuda Saturday morning, other models are faster and father east by Friday night. After this, Bill recurves and passes southeast of Cape Race, Newfoundland into the north Atlantic heading past Iceland. Bill is expected to stay east of the U.S. coastline. We are watching the squall bands around Bill, they may be northeast of the Leewards at closest pass Wednesday...it should be close. Bill is definitely a category three hurricane now. We fully expect NHC to upgrade at the next advisory time. The eyewall is becoming more solid and the cloud tops cooling. There is a good chance for cat 4 by tomorrow or tomorrow night. ( Category 4 = 131-155 mph ) The latest forecast models also now suggest that a few squalls may affect the Leewards as bill passes to the northeast. There are many travelers taking cruises concerned about the effects of Bill. This will be determined by the route of the cruise ship which will try to avoid Bill. At 7:30 pm edt / ast Bill was centered near 17.0° N / 52.8° W or about 540 miles east of the Leeward Islands / 1300 miles southeast of Bermuda. Movement is west northwest at about 15 mph. We estimate top sustained winds of 120 mph and increasing. Late Friday Night: moving west of Bermuda by 100-150 miles. Saturday: Well east of Cape Hatteras, NC. Sunday late: east of Nova Scotia, Canada. Monday: southeast of Newfoundland, close to Cape Race. Bill continued its quick deepening phase overnight. As we mentioned last update, there was potential for Bill to become a category 4 hurricane today. Bill made it faster than we anticipated. 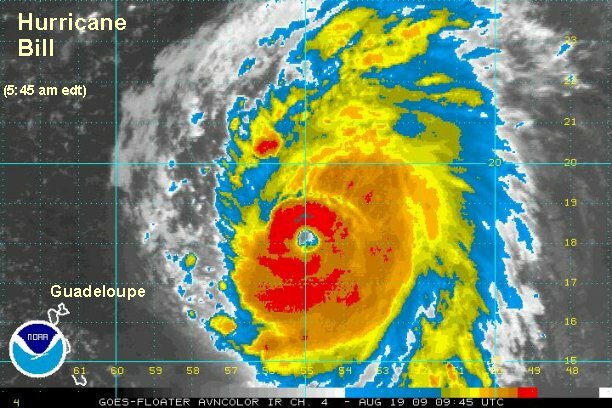 Rapid deepening cycles can strengthen a hurricane very quickly as the terminology suggests. As for now, Bill is fighting southwesterly wind shear. This can be seen be looking at the satellite imagery. Outflow aloft is excellent on the east side where a cirrus cloud pattern is observed. On the west side this is not the case. When a hurricane gets this strong eye replacement cycles come into play. Strengthening and weakening is very hard to predict. Even though Bill is fighting shear, we think that there is room for more strengthening. The hurricane appears to be taking "a rest" for the past few hours. 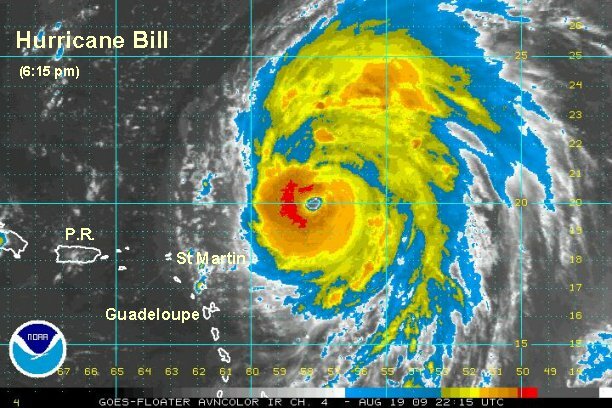 At 6:30 am edt / ast Bill was centered near 18.3° N / 55.2° W or about 390 miles east northeast of the Leeward Islands / 1140 miles south southeast of Bermuda. Movement is west northwest at about 15 mph. We estimate top sustained winds of 135 mph. We believe that a few squall bands will move into the Leewards tonight and continue into the first half of Thursday. Remember this is the edge of the hurricane, not the full force. There could be some gusts to 30-40 mph. Most of the effects will be heavy rain in the bands. Sunday late: near eastern tip of Nova Scotia, Canada. Overnight Sunday / early Monday: near Newfoundland, Canada. The major change is bringing Bill close to Newfoundland Sunday night / Monday morning. There are many travelers taking cruises concerned about the effects of Bill. This will be determined by the route of the cruise ship which will try to avoid Bill. This makes it impossible for us to predict exact conditions that will be experienced. Bill has leveled off since the rapid deepening phase last night. Bill remains a minimal category 4 hurricane. Bill is a large system and should generate large swell. Seas up to 44' are indicated near the eyewall of Bill. The highest seas are confined to a zone a few hundred miles around the eye. 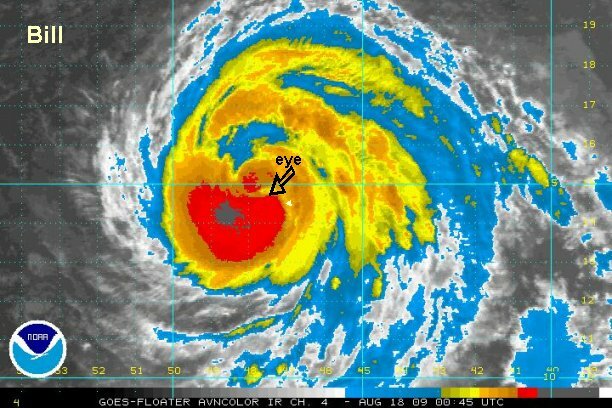 At 11:00 am edt / ast Bill was centered near 18.7° N / 56.3° W or about 380 miles east northeast of the Leeward Islands / 1080 miles south southeast of Bermuda. Movement is west northwest at about 18 mph. We estimate top sustained winds of 135 mph (NHC same). Lowest pressure reported from the recon: 950 mb. Bill has changed little again today. At this time Bill is making its closest pass to the Leewards. Some bands may affect the the Islands into Thursday. A recent bouy centered about 120 miles north northwest of the path of bill is indicating wind gusts to about 50 mph with 19' seas. Maximum seas are over 40' in the eyewall of Bill. 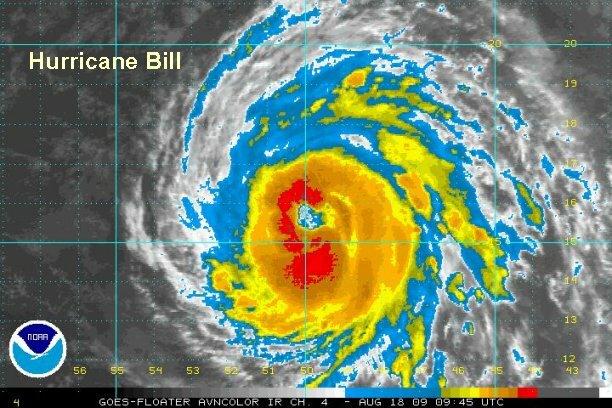 At 7:00 pm edt / ast Bill was centered near 20.1° N / 57.9° W or about 300 miles northeast of the Leeward Islands / 945 miles south southeast of Bermuda. Movement is west northwest at about 19 mph. We estimate top sustained winds of 135 mph (NHC same). Lowest pressure reported from the recon: 947 mb. Late Friday Night / Early Saturday Morning: moving west of Bermuda by about 150 miles. Saturday: Well east of Cape Hatteras, NC 500 miles or more. Early Sunday: Passing 250-300 miles east of Cape Cod. Sunday: near south coast of Nova Scotia or just offshore. Sunday late: near the central coast of Nova Scotia, Canada. Overnight Sunday / early Monday: near or east of Newfoundland, Canada. Bill will accelerate as it is picked up by a strong upper trough on the east coast. It will rapidly move past eastern Canada Sunday and Sunday night. Westerly wind shear has weakened Bill a touch. Bill's appearance on satellite shows the weakening with outflow being restricted on the western side of Bill. Bill passed within 75 miles of a buoy over the past several hours. Seas up to 39' were measured. Right now that buoy is measuring 28'. Highest waves with Bill are now over 50'. Keep in mind that this is in a very small area near the center. At 7:00 am edt / ast Bill was centered near 21.9° N / 60.9° W or about 340 miles north northeast of the Leeward Islands / 760 miles south southeast of Bermuda. Movement is northwest at about 18 mph. We estimate top austained winds of 125 mph (NHC same). So far with Bill, we have been in very good agreement with the Hurricane Center's wind estimates. Lowest pressure reported from the recon: 948 mb. Effects: Scattered showers and storms are in the Leewards and will continue today. It appears that the winds will not gust higher than 25-35 mph in the storms. Expect rough surf on eastern U.S. coast, Bermuda, Leewards, and eastern Canada coast from swell produced by Bill. Depending on which model is correct, winds and rain will pick up Saturday night across coastal New England. Effects will arrive near Cape Cod first then work their way north to eastern Maine early Sunday. Cloud tops are cooling in the eyewall again. This plus increased upper wind outflow to the west indicates that the next strengthening phase has begun. 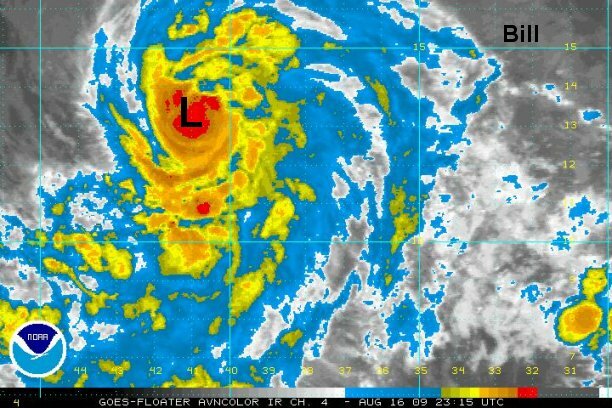 At 5:00 pm edt / ast Bill was centered near 23.8° N / 63.2 W or about 595 miles south southeast of Bermuda. Movement is northwest at about 18 mph. We estimate top sustained winds of 125 mph (NHC 125 mph). So far with Bill, we have been in very good agreement with the Hurricane Center's wind estimates. Lowest pressure reported from the recon: 948 mb. Effects: Scattered showers and storms are in the Leewards are starting to fade away. Expect rough surf on the eastern U.S. coast, Bermuda, Leewards, and eastern Canada coast from swell produced by Bill. Some gusty winds and locally heavy rain may brush Cape Cod Saturday night and Sunday morning. These effects will move into downeast Maine early Sunday and last most of the day. Nova Scotia will get very windy weather, rough seas as well as heavy rain during the day Sunday. Newfoundland will see the worst weather Sunday night and into early Monday. The worst of this hurricane appears to be headed to southern Nova Scotia and Newfoundland. This is the region of greatest concern. Sunday: Over Nova Scotia or just offshore. Sunday late: near the central /east coast of Nova Scotia, Canada. Down the road...Bill will transform into a large north Atlantic gale and may bring nasty weather to Europe. Just as Bill began a strengthening phase, wind shear picked up. This has weakened Bill. 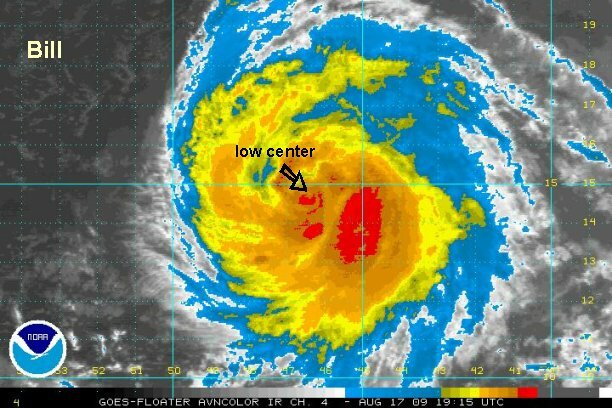 At 10:00 pm edt / ast Bill was centered near 24.9° N / 64.0 W or about 520 miles south of Bermuda. Movement is northwest at about 17 mph. We estimate top sustained winds of 115 mph. So far with Bill, we have been in very good agreement with the Hurricane Center's wind estimates. Lowest pressure reported from the recon: 948 mb. Some gusty winds and locally heavy rain may brush Cape Cod Saturday night and Sunday morning. These effects will move into down east Maine early Sunday and last most of the day. Nova Scotia will get very windy weather, rough seas as well as heavy rain during the day Sunday. Newfoundland will see the worst weather Sunday night and into early Monday. The worst of this hurricane appears to be headed to southern Nova Scotia and Newfoundland. This is the region of greatest concern.